Happy Spring! I'm loving all the colorful patterns I am seeing pop up everywhere! 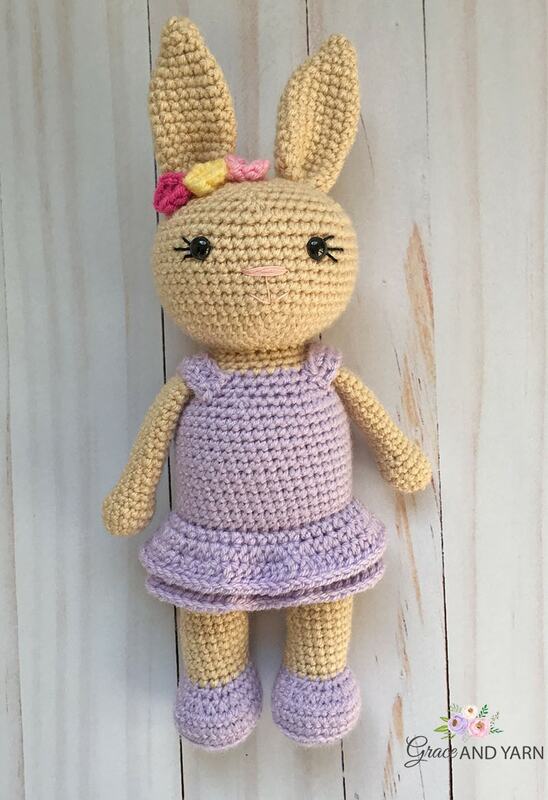 Whether you are looking for a pattern for Easter or Spring (or any ole time) these Berry Patch Bunnies are a quick and easy make. Below is the girl version, you can head over here to find the boy version! These bunnies were purposely made about the same size as my other forest animals, so they can be played with together as friends or displayed nicely at a craft fair. Be sure to visit Holly the Honey Bear, Mia and Marshall the Frog for more amigurumi fun! 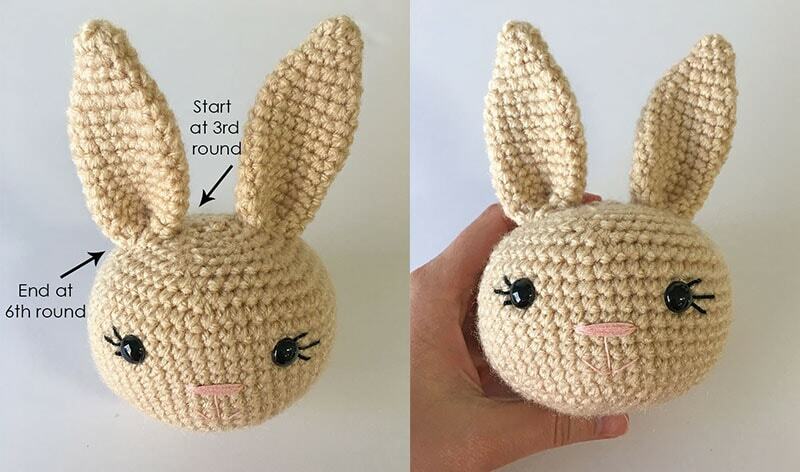 If you are new to amigurumi check out my tips and materials page to help you get started! 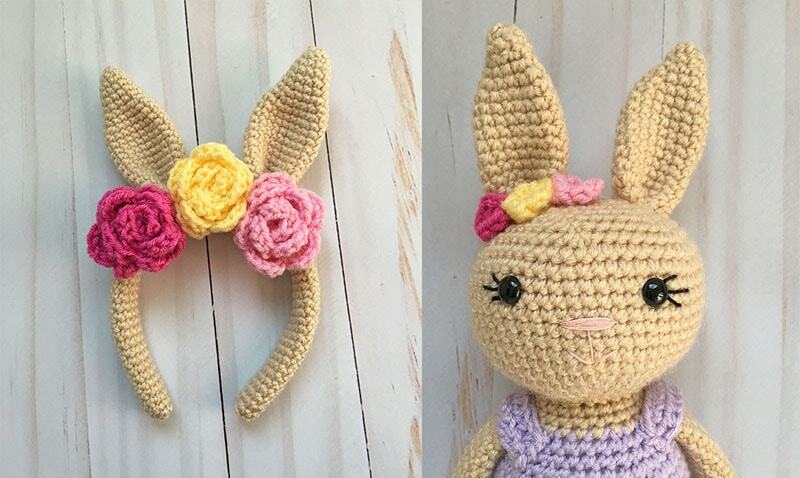 This bunny measures about 14 inches from ears to feet and would be a cute gift paired with my Crochet Bunny Headband. The color combinations are endless! Fasten off on the first leg only. At the end of Round 24 on the 2nd leg, complete a SC in each of the next 6 stitches (this will line up your legs to be straight when we join). Round 25 joins the legs together and starts the body. Round 25: Chain 3 and attach to the first leg with a SC (make sure both of your feet are facing the same direction), SC in the remaining stitches around the leg, when you reach the chain make a SC across each of the 3 chains, SC in the remaining stitches of the next leg and SC across each of the 3 chains (you will have SC on both sides of the 3 chains now) (42 SC) This completes your join and is where your next round will start. *Stuff your head firmly as you go. Sew the ears onto the head, placing them evenly apart in line with the eyes. I started at the 3rd row and finished at the 6th row. Pull the circle tight and slip stitch to the first petal to close, fasten off leaving a long tail for sewing. Attach to the ear of your choice. 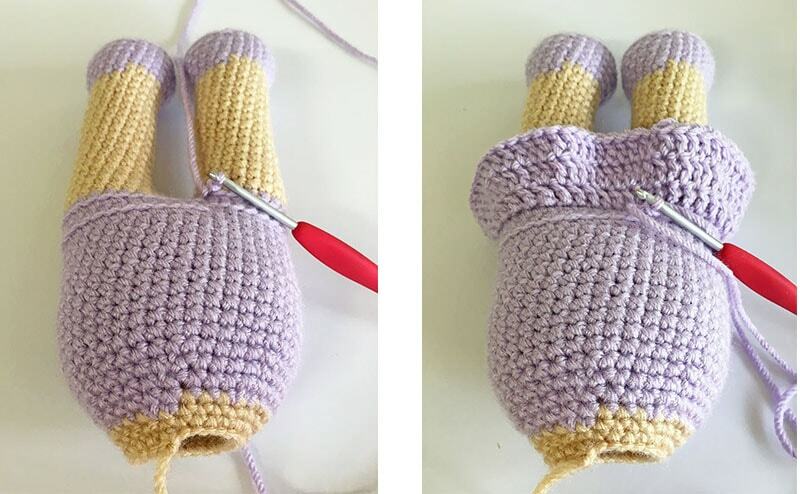 With orchid create a slip knot and attach with a slip stitch to one of the front loops from round 28 (For a cleaner look attach at the back of the body). As we did above create a slip knot and attach with a slip stitch to one of the front loops from round 30. (NOTE: For this layer the first two round will be done in HDC and the 3rd round will go back to DC). Fasten off and weave in end . 1. Sew the head onto the body, making sure to have the facial features centered. Add more stuffing as you go to make it firm and less wobbly. 2. Next sew the arms onto the body centered with the head at row 44. 3. Sew your straps on over the arms, starting and ending at row 44 on each side. You're all done, I hope you've enjoyed this pattern! If you made a Berry Patch Bunny I would love to see her! Feel free to share a picture with us on Facebook! Does this mean that for round 7 there are 30 SCs and for round 8 there are also 30 SCs? This means 60 in total. Does it mean it is 30 SCs in total for round 7 and 8? Thanx for awesome patter, could I download it?! And how?! Hello! I'm having a lot of trouble on row 25. Is there another way to explain this row? I've made both legs and single crochet 6 times (right leg), chained 3 and connected to left leg and continued to crochet around on the left leg. When I'm back to the chain 3...I get completely lost. Should I chain another 3 and connect to the right leg? Or single crochet into the chain 3 and continue to single crochet in the right leg until I'm back to the chain and finish with single crochet into that chain for a 2nd time? This probably sounds confusing but it looks like you have two sturdy connecting chains coming from both legs but as I'm working it, I get one thick chain but the legs are only connected with that one chain. Please help! Hi do you ch 1 at beginning of every round? Hi! You will want to crochet in a continuous round (we will not be joining each round unless otherwise stated). Using a stitch marker will come in handy to keep track of each round.